Based on Tonino Benacquista’s novel Malavita, The Family stars Robert De Niro as Fred Blake aka Giovanni Manzoni, a one-time mob boss now in Witness Protection after ratting out his pals. With a bounty on his head from an imprisoned former Mafia cohort, the authorities (led by Lee Jones) relocate Fred and his family — wife Maggie (Pfeiffer), daughter Belle (Agron), son Warren (D’Leo), and dog Malavita — to Normandy. Fred and his family try to adapt to life in a boring small French village where the townsfolk don’t seem to be happy with Americans moving into their small town. This leads to altercations with neighbors, local officials, shop keepers, school, you name it. Meanwhile, the mob narrows their search for the family. Needless to say, it wouldn’t be a movie if the bad guys didn’t eventually catch up with the good guys (or in this case, the less bad guys) in a bullets-blazing finale and in a true Luc Besson fashion. It’s interesting to see De Niro, Lee Jones and Pfeiffer play up their somewhat “typecast” characters. De Niro has poked fun at his mobster film legacy for quite awhile now and he does it here again, but it still works. Pfeiffer, whose early mob wife roles include Scarface and Married to the Mob, puts on an Italian/NY accent that doesn’t sound out of place. Then there’s Tommy Lee Jones playing an unsmiling, no-nonsense lawman. But it all works because there good actors. As solid as all three major stars are in the film, you may find yourself equally impressed with the two younger leads playing the Blake kids. Agron shows she can do more than simply be that girl from Glee, although at times her performance for me was a bit too much, while new comer D’Leo steals his scenes and proves he’s truly his father’s son. 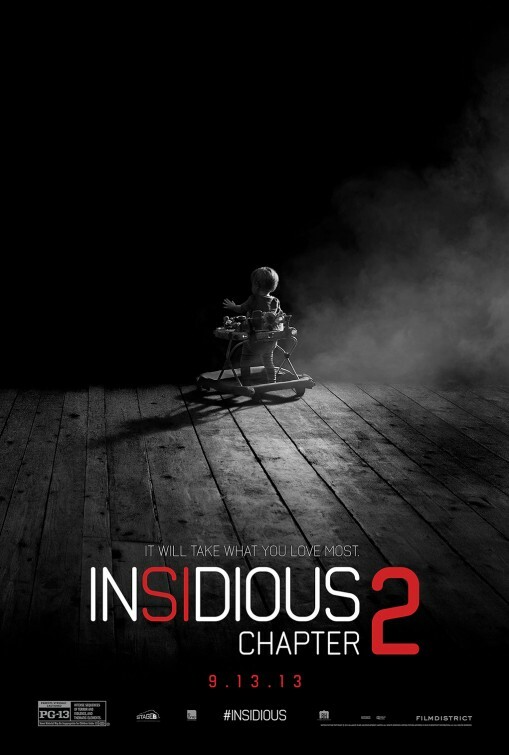 Like I said this is a Luc Besson-directed movie so there’s plenty of violence (but not gory) and action. Besson throws in flashbacks to Fred’s past criminal life, which helps us get to known more of De Niro’s character. It also helps since the movie is told through Fred’s voice because he’s writing his memoirs. But through this, we see how Fred holds nothing back. He knows he’s done bad things in his past but we still root for him and his family in the end. All in all, The Family has it all; action, drama, comedy, and a little romance. Everyone seems to be enjoying themselves and it leads to us having a good time too. Are there things that are a bit predictable? Sure, but it’s still fun to see. Left for dead by the Necromongers (in really only cameo appearance) on the a hospitable planet, Riddick (Diesel) fights to survive against the wide variety of deadly beasts roaming this planet. His only way off is to actually call in the very people he would otherwise hope to avoid: bounty hunters. Two different groups of bounty hunters soon arrive. The first is a down and dirty group led by Santana (Molla) and whose members include Bautista’s as Diaz, while the second team is a more paramilitary group led by Boss Johns (Nable) and Dahl (Sackhoff). Riddick’s plan to get hold of one of their ships to escape doesn’t work out timing-wise. A massive storm arrives, bringing with it hordes of slithery, man-killing monsters. Of course, Riddick and the bounty hunters must work together in order to escape their deaths. 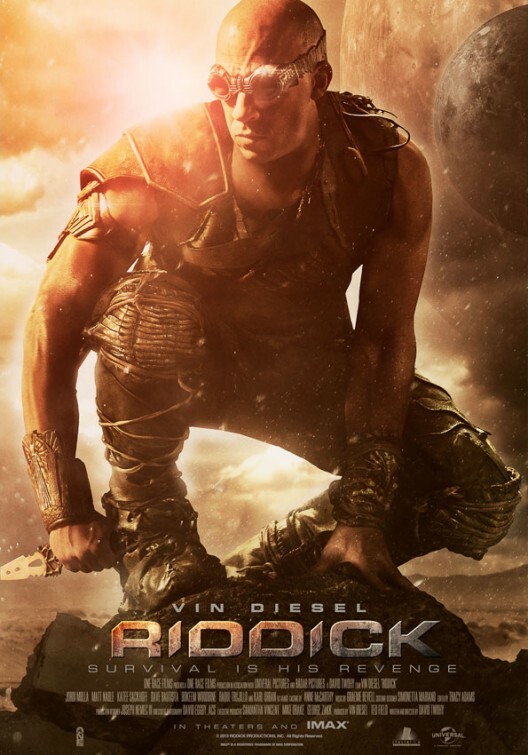 Riddick does go back to the old formula that started in Pitch Black, sci-fi horror with an R rating. I mean this movie holds nothing back when it comes to the death scenes, and they are good death scenes. But a good chunk of the movie is a one-man show as Riddick survives alone on the planet. Dealing the being double crossed and surviving the variety of monsters. Once the bounty hunters arrive Riddick disappears for a bit, which could be a risky for a title character, but that’s when we’re introduced to the bounty hunters. Molla’s looks like he’s enjoying himself while playing the foul-mouthed leader of the “hot heads” group Santana. While Nable’s character,being more of the good-bad guy, has more a personal mission against Riddick and hides most of his emotion. Sackhoff, surprisingly doesn’t have much to do here except act gruff which is kind of a shame. He does have her moments to shine but it’s a shame that the only real female in the cast doesn’t have much to do. Bautista’s henchman Diaz has some scene-stealing moments. All the other bounty hunters are really just there to be victims, which really shouldn’t surprise you. Like I promised on the show on Friday (yeah I have a radio show on Friday’s at 12-2pm Central time. Link to listen is radio.morton.edu just like that OR you can go to Tunein and search Morton College Radio) I will start posting a few tidbits from the show. Starting this trend is my rant/vent of Ben Affleck playing Batman/Bruce Wayne. I wrote something about this last week but I’ve added a few things. I also forgot to mention that Christopher Nolan (director of Batman Begins, The Dark Knight and The Dark Knight Rises) was not accepted by fans either (will make more sense when you hear the video). Anyway I hope you like it and what do you think?